WHO/Europe | Is European Region ready to respond to next influenza pandemic? Countries Denmark Is European Region ready to respond to next influenza pandemic? Is European Region ready to respond to next influenza pandemic? Dr Nedret Emiroglu, Director of Programme Management and Director of the Division of Health Emergencies and Communicable Diseases of WHO/Europe – posed these questions to the representatives of 50 European Region countries and partner organizations gathered at the 6th Joint WHO/Europe–European Centre for Disease Prevention and Control (ECDC) Annual European Influenza Surveillance Meeting, held in Copenhagen on 6–8 June 2018. The 2018 influenza meeting was a special one, as the European Region and the world commemorate the centenary of the 1918–1919 influenza pandemic, the most severe pandemic ever recorded. As such, the meeting was a timely reminder of the importance of the Region-wide influenza network that celebrates its 10th anniversary also this year. To date, less than 1 in 3 countries in the European Region have revised their pandemic influenza plans since the 2009 pandemic. This meeting called on the remaining countries to contribute to health security by ensuring they have up-to-date pandemic preparedness plans developed according to international standards. In addition, influenza vaccination uptake has been steadily declining in a number of countries in the Region since the 2009 pandemic, and access to influenza vaccines remains low in lower-resourced countries. Not only is this of serious concern for the protection of vulnerable groups against seasonal influenza, but also for pandemic preparedness as the production of pandemic vaccines is closely linked to seasonal vaccine use. Season 2017/2018 saw many hospitalizations among older people from the influenza B strain that was not included in trivalent vaccines, thus some countries recommended a switch from trivalent to quadrivalent vaccines to ensure broader protection. For countries with limited resources, this might result in less available doses, due to the higher price of quadrivalent vaccines. However, considering the overall costs for the health-care sector, quadrivalent vaccines can also prove cost-effective. WHO is ready to assist European Region countries to update and implement their plans at national level. The Organization has secured pledges for 405 million doses of pandemic vaccine to be provided in real-time in the next pandemic. This is approximately 4 times the amount of pandemic vaccine that was available during the A(H1N1) pandemic in 2009. In addition, WHO has enhanced support to countries in need of strengthening their capacities for surveillance and response. Those efforts have borne many fruits: for example, Armenia and Montenegro’s national influenza centres have recently obtained formal recognition by WHO as members of the Global Influenza Surveillance and Response System (GISRS). 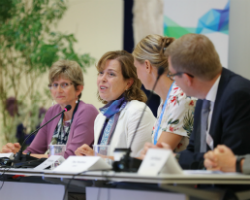 “The meeting provided a forum to observe surveillance improvements across the Region, and highlighted areas where we can enhance our data analysis and presentation to be more useful to the public and health decision-makers,” said Pasi Penttinen, Head of the Disease Programme for Influenza and Other Respiratory Viruses at ECDC. The European Influenza Network is part of the GISRS, the oldest WHO network, and is a critical resource for global health. Half of the 53 countries in the European Region now report hospital surveillance data to WHO, and over 90% share viruses. These are critical achievements towards the Region’s and the world’s preparedness for the next pandemic. The meeting was cohosted by Denmark’s Statens Serum Institut (SSI), which has advanced influenza surveillance by using electronic health registries to link hospital data on treatment and outcomes with laboratory results and vaccine use. SSI, together with ECDC and WHO/Europe, also facilitates EuroMOMO, which monitors weekly mortality data in the Region, an important marker for disease severity. The meeting provided a unique opportunity to introduce EuroMOMO to new countries interested in sharing their data for rapid analysis.